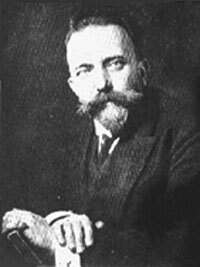 Karl Wilhelm Arthur Heffter identified mescaline as the active principle in the peyote cactus. He was a leader during the classical period of Pharmacology, was the first chairman of the German Society of Pharmacologists, and was largely responsible for the first Handbook of Experimental Pharmacology. Born in Leipzig Germany, on June 15, 1859, Heffter studied chemistry in Freiburg, Leipzig, and finally at Greifswald. After receiving his Ph.D. (1883) with a dissertation titled 'Some new sulfur compounds derived from p-toluidine', he assisted O. Nasse, a pharmacologist and physiological chemist (1884-1886) and studied medicine at the Pharmacological Institute at Leipzig. He also worked in the laboratory of Rudolph Böhm, where he discovered choralose. After receiving his M.D. degree and doctorate in pharmacology at Leipzig in 1890, Heffter did seminal work on alkaloids derived from the peyote cactus (Lophophora williamsii, which was then called Anhalonium williamsii) (1888). He was the first to gain the title of "psychonaut", because of his willingness to test on himself (bioassay) the chemicals he isolated. He was given the name by Ernst Jünger in his logbook of personal drug experimentation Annäherungen: Drogen und Rausch (Drugs and Inebriation). It would be nearly 50 years before the Swiss chemist Albert Hofmann would discover the effects of LSD.